As billions of people around the world—including millions of Nepalis—are glued to their televisions watching the 2018 World Cup, I wish to reminisce about the humanitarian dimension of a great football star who is currently not in the pitch. Pelé. Everybody knows Pelé as probably the best football player in the world in history. But few people know about his important contribution to other great social causes. Unbeknownst to many of his fans, Pelé helped save the lives and improve the health of millions of children in Brazil. He also helped promote such worthy global causes as ecology and environment, sports and development and peaceful resolution of conflicts as goodwill ambassador for the UN, UNESCO and UNICEF. In the 1980s and 90s UNICEF was involved in promoting many innovative methods of social mobilization to influence child-friendly public policies in Brazil. One example was promotion of breastfeeding to enhance child health and to reduce the high rates of infant mortality and malnutrition. Due to the aggressive marketing of baby milk formulas by private multinational companies, breastfeeding had declined dramatically to the point that in the 1980s only eight percent of Brazilian mothers exclusively breastfed their babies during the first six months. UNICEF explored how best it could help reverse this dangerous trend. Efforts to promote breastfeeding by the Ministry of Health and by concerned pediatricians were not producing the desired results in the face of very aggressive and deceptive advertising by the infant formula companies. In its search for who might be the most respected and credible messenger whose advice mothers would pay attention to, UNICEF came up with the most unusual yet obvious choice: Pelé—Brazil’s most popular and the world’s best football player. It did not take much effort for UNICEF to convince Pelé to lend his name to this worthy mission of saving the lives and protecting the health of millions of Brazilian children. Decline in breastfeeding affected all segments of Brazil’s population but the worst consequences were among the poorest. Many poor women were influenced by formula advertisers who presented bottle-feeding as the healthy and glamourous alternative to breastfeeding. Rich and beautiful women were shown as preferring bottle-feeding over breastfeeding. Even doctors and nurses in hospitals were enlisted by infant formula companies to influence new mothers to switch to bottle-feeding. As the world’s leading child health organizations, UNICEF, WHO and the International Pediatric Association, had uncontested scientific evidence that breastfeeding was the best nutrient for infants, and that exclusive breastfeeding for the first six months and continued breastfeeding for up to two years with gradual introduction of healthy weaning foods protected children from infection, malnutrition and common childhood diseases. With rare exceptions, all mothers are capable of breastfeeding which has many lifelong advantages for infants as well as for their mothers and society as a whole. This poster became the centre-piece of a breastfeeding promotion campaign that led to a dramatic increase in exclusive breastfeeding to almost 40 percent within a few years. The lives of thousands of Brazilian children were saved and health of millions improved as a result of this campaign. As UNICEF’s Chief for Latin America and the Caribbean in the 1980s, and later as its global Program Director, I had the opportunity to visit Brazil many times and witness the impact of Pelé’s contribution—along with that of the Catholic church and Brazil’s vibrant media—in that country’s impressive progress in child survival and development. Pelé was receptive to UNICEF’s message partly because of his own personal experience of growing up as a poor child. Born in 1940 in a poor community in the state of São Paulo in southern Brazil, Pelé’s real family name was Edson Arantes do Nascimento. He grew up in poverty earning money by working in tea shops as a servant. Taught to play football by his father, he could not afford a proper football. He often played with either a grapefruit or an improvised ball made of old socks stuffed with newspapers and tied with a string. Given this personal experience, Pelé is very sensitive to the plight of children suffering from poverty. He has been a strong supporter of UNICEF and the UN’s anti-poverty development goals. 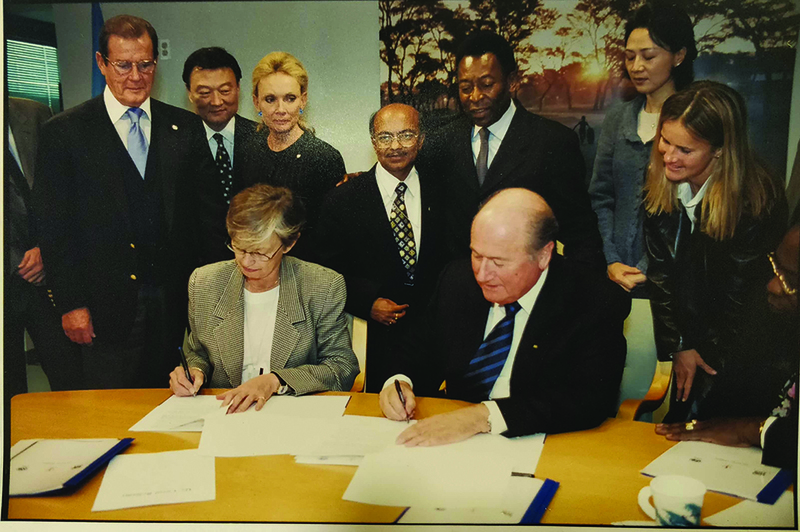 I had the opportunity to meet and interact with Pelé in 2001 when I was leading UNICEF’s plans for organizing a Global Summit at the UN General Assembly Special Session on Children. To build momentum for the Summit to come up with ambitious goals and strong commitment, UNICEF had launched a “Say Yes for Children” campaign with active support of luminaries like Nelson Mandela, UN Secretary-General Kofi Annan and dozens of world leaders. One of the highlights of the campaign was a special partnership with FIFA. We invited FIFA President Sepp Blatter and several famous football stars and UNICEF Goodwill Ambassadors to join. The most prominent among them was Pelé, who signed the “Say Yes…” campaign as part of “UNICEF-FIFA Global Alliance for Children”. I was happy to be part of that memorable ceremony at which I asked Pelé to sign a football jersey for my son Biplav Gautam, a sports enthusiast, who treasures that jersey as one of his proud possessions. In another memorable event, Pelé helped UNICEF and FIFA to kick off the 2006 World Cup in Germany as part of a campaign to utilize the power of football to create self-esteem, mutual respect and fair play among children, and to spread the message of peace. 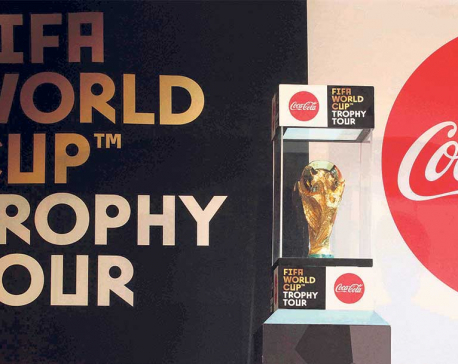 Pelé carried the World Cup trophy onto the pitch in Munich alongside supermodel and UNICEF Goodwill Ambassador Claudia Schiffer. Around 150 former World Cup winners also took part in the spectacular opening ceremony watched by more than a billion people around the world. A special World Cup website created by UNICEF in Arabic, English, French and Spanish invited fans to join a virtual team of UNICEF supporters around the world captained by England star and UNICEF Goodwill Ambassador David Beckham and joined by other soccer heroes like Didier Drogba (Côte d’Ivoire), Lionel Messi (Argentina), Francesco Totti (Italy) and many others. All of these players appeared in a series of TV spots produced by MTV for UNICEF and FIFA, which were broadcast around the world and in every stadium before each match. The spots ended by asking viewers to ‘UNITE FOR CHILDREN, UNITE FOR PEACE’. Due to ill health Pelé was unable to join in the opening of the 2018 World Cup in Russia. But his example has inspired millions of young people to join the ‘beautiful game’ and contribute to building a peaceful and prosperous world fit for all our children.